Sometimes, the only thing turning the other cheek gets you, is big fat neck muscles. According to the Mayans we may or may not all wake up December 22nd, and I for one would hate to shuffle off this mortal coil full of venom and bile. I want to start things off with a clean slate, that’s why I’m going to get some thing off my chest in the next few weeks. 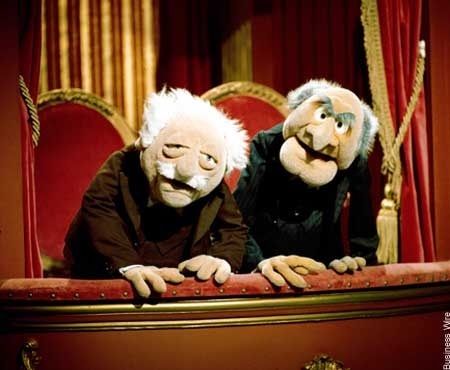 I enjoy letting things fester, I want to be Statler and Waldorf, those two old guys who sat up in the balcony and made fun of everyone on the Muppet Show. … I’ve always been very quick to judge all those about me, so it’s a natural that I be the one to stab through the heart all the artifice and overly elaborate politically correct nonsense that passes for civility. Angry, for want of a better word can be good, sometimes the shiny happy surface is devoid of meaning and simply that… surface…. not nearly as interesting and meaningful as the gnarly, matted underbelly. To glimpse behind the curtain is to see the real goods. Allow me to be your Toto, let me pull back the curtain and show you the all-powerful OZ. I have a unique perspective, my years of intelligence work for shadow agencies around the globe has given me access to information and knowledge you would never be privy too, facts and data, you couldn’t possibly comprehend. I’ll be careful to ensure certain filters remain intact, I don’t want my conscience littered with the responsibility of blowing your mind. I’m wrapping up this post, you should consider it a prelude to what’s to come… the first topic, which we’ll get to next time… may just be one of the most important documents, ever… it concerns Honey Boo Boo and what she means to you.